The leather weft is hand cut from eco suede, a thicker quality of leather which gives a three dimensional effect to the weave. This bold check design is woven with wide cut strips of suede and lush silk boucle. The fine strips of leather is hand cut from extra soft suede, the handle is gentle and drapes nicely. Line's 'Hand Woven Leather' fabrics are attractive, tactile and truly artisanal. Each strip of leather is hand cut in the studio from soft leather, giving the finished woven piece movement and individual character. We make all pieces to order, allowing the customer to choose from a selection of colours, our maximum width is 75 cm. The collection is viewable by appointment only, for more information on how to buy or to arrange a meeting, please get in touch. Lampshades LITA and MONA created for 'Spot the Talent', a Hothouse 2017 exhibition at the New Ashgate Gallery in Farnham. Detail of feather edge on lampshade SURI created for 'Spot the Talent', a Hothouse 2017 exhibition at the New Ashgate Gallery in Farnham. Detail shot of fabric from lampshade MONA. Cotton/Viscose/Linen/Wool/Latex/Lurex/Silk. Line first started developing woven lampshades with translucency in mind; lampshades that don't block the light, but rather softens it, whilst incorporating beautifully hand crafted textiles. All Lampshades are bespoke so please allow 4-6 weeks lead time. For details on how to buy or for prices, please contact us. As a craftsman and weaver, I am always grateful for the opportunity to work in collaboration with other makers; masters of a different trade. Ideas are taken further, you learn from each other and push to achieve new and exciting results. I am proud to present ARNE, an elegantly handcrafted beech bench covered in DATA, a handwoven textile made from cotton and hand cut leather. A collaboration project between highly skilled furniture maker Juan Junca and Line Nilsen. NAMI - Hand woven cushion, elegant subtle texture and lustre. Cotton/Merino/Lurex. JUNE - Hand woven cushion made with fine strips of printed silk crepe de chine. EDEN Velvet - Designed by Line Nilsen. Printed in England, made in Nottingham, duck feather insert Available in more colours and also as silk satin. All woven cushions are made to order, woven by hand using floor looms in our Nottingham studio. 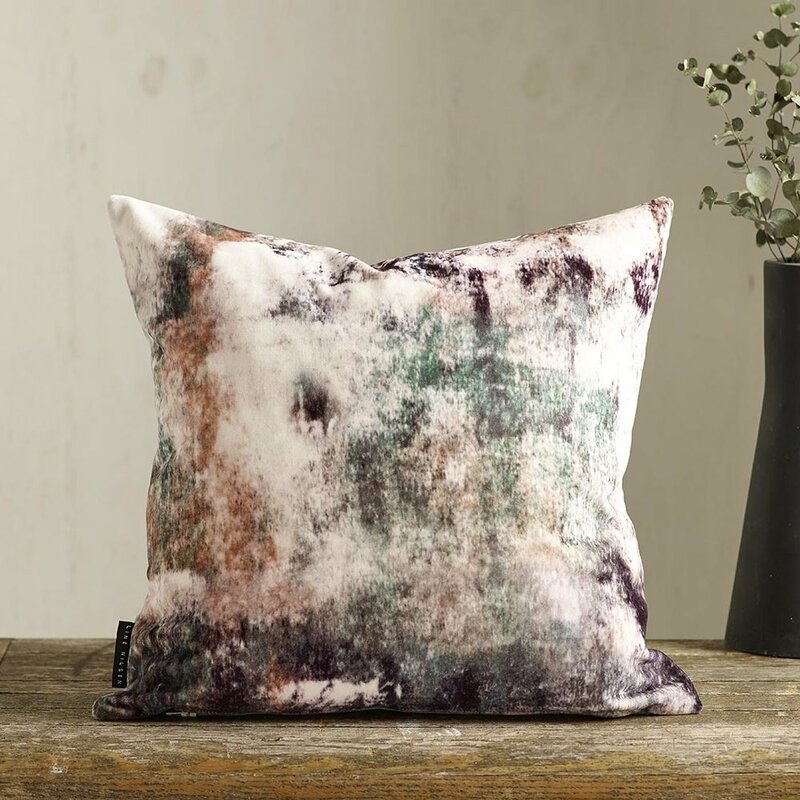 Printed cushions are designed, printed and made in the UK, using the finest cotton velvet and silk satin fabric. For prices and enquiries, please get in touch.